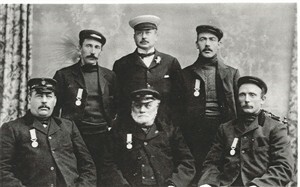 James Haylett and other Caister lifeboatmen, c1906? 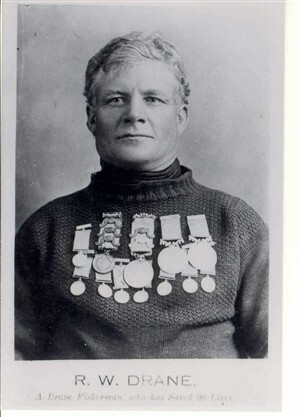 Unidentified RNLI gold medallist? c1900? The three photos featured were probably taken around the beginning of the twentieth century. I have not been able to trace published copies, and so what follows is guesswork. Please put me right, if you know different! 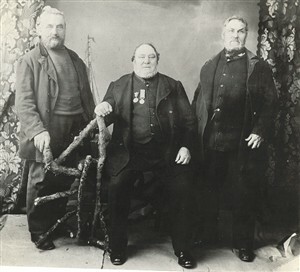 The first photo almost certainly shows men of the Caister lifeboat. The man in the centre of the front row is likely to be James Haylett. He it was who, in November 1901 at the age of 78, went to the aid of the upturned Caister No.2 lifeboat Beauchamp. To quote from Lifeboat gallantry by Barry Cox (Spink, 1998), "With his grandson, he dashed into the water and brought three men to safety. One of the survivors was also a grandson and another a son-in-law, but he lost two sons in the incident. Altogether, he was on the beach for 12 hours in bitter cold weather, wet through and without food." In 1902 at Sandringham, King Edward VII awarded James Haylett the RNLI's gold medal. It was James Haylett who first uttered the legendary words "Caister (lifeboat)men never turn back". As for the other men in the first photo, I speculate that those four wearing medals could be John Haylett, John Plummer, Solomon Brown and Walter Haylett. They were coxswain superintendent, assistant coxswain and crew members of the Caister No.2 lifeboat Nancy Lucy and won RNLI silver medals for their part in a rescue from the Anna Precht in September 1906. The second photo gives me the impression that it may date from the late 19th century. Could it show a coxswain of the Great Yarmouth or Gorleston lifeboats? The third photo is clearly captioned "R.W.Drane, Brave Fisherman, who has Saved 90 Lives". A very quick look at the 1901 census on the National Archives website shows Robert Drane, a fisherman of Great Yarmouth, aged 77. Was this he, or a younger relative? Did he serve with the Great Yarmouth and Gorleston lifeboat? 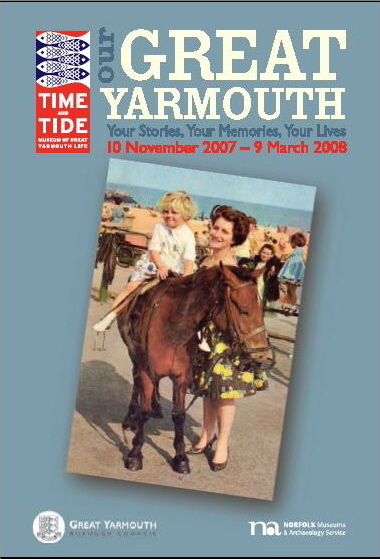 Thanks to "Peggotty" writing in the Great Yarmouth Mercury of 10 July 2009, I now have more information. It was Robert William "Chickie" Drane, who reckoned he saved 115 lives in 62 years. The last was at the age of 76, when he dived into the Bure to rescue a 4-year old. He had been a member of the Gorleston lifeboat crew for 14 years. He died, much decorated for his gallantry, in 1934. This page was added by Paul Douch on 17/11/2007.